LG’s second major smartphone announcement – the first being the Nexus 5X – is now official as the South Korean company has taken the wraps off its oft-teased V10 smartphone. The handset features a 5.7-inch IPS display operating at a resolution of 2,560 x 1,440 (513 PPI) that’s powered by Qualcomm’s six-core Snapdragon 808 SoC (Adreno 418 GPU) alongside 4GB of RAM. There’s also 64GB of local flash storage expandable via microSD card slot, a removable 3,000mAh battery and a 16-megapixel rear-facing camera with laser auto-focus, optical image stabilization and f/1.8 aperture (the same camera from the LG G4). Other notables include a fingerprint scanner, LTE-A Cat. 6 networking, 802.11 a/b/g/n/ac Wi-Fi, Bluetooth 4.1, NFC and a 32-bit Hi-Fi DAC. It’ll ship with Android 5.1.1 Lollipop although LG said it is working on a Marshmallow update. The V10’s chassis is built from SAE grade 316L stainless steel with a silicone-like Dura Guard layer on the rear for added protection. The phone’s flagship features include a secondary 2.1-inch front-facing display (160 x 1,040 resolution that’s also 513 PPI) and a pair of 5-megapixel forward-facing cameras that can shoot wide-angle (120-degree) selfies. 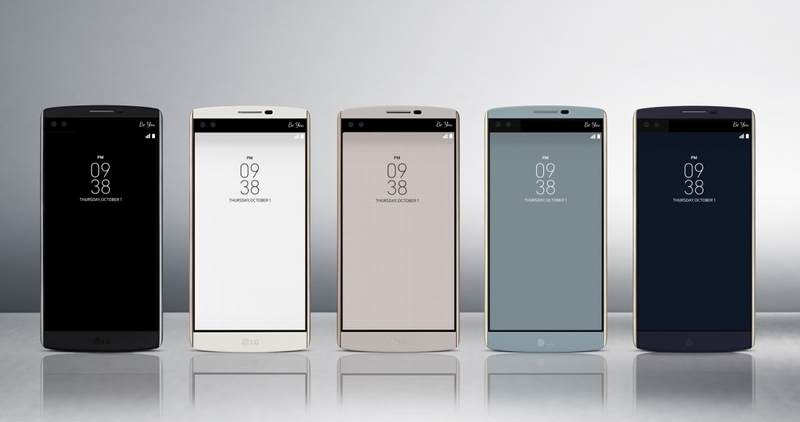 The LG V10 will be available in five colors – space black, luxe white, modern beige, ocean blue and opal blue – starting first in South Korea later this month with plans to bring it to the US, China and select countries in Asia, Latin America and the Middle East afterwards. No word yet on pricing.